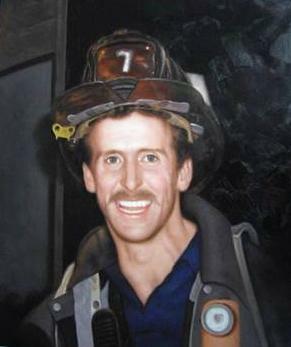 On September 11th, George C. Cain of Tower Ladder 7 lost his life in the World Trade Center attacks. He was, like many of his fellow firefighters who died that day, a remarkable man. His life was a joy and his memory a comfort. Firefighter George Cain was preparing to run the New York City marathon this fall. "He always kept himself in good condition. He was a skier, a golfer, a mountain climber. Most of all, he was a people person," said his mother, Rosemary, of Massapequa. "There was nothing he wouldn't do to help people. He was the first one off the truck." The World Trade Center alarm came minutes before Cain, 35, was to complete his shift with Ladder Co. 7 of Manhattan's Battalion 8. He was climbing the stairs in search of survivors when one of the towers collapsed. His cousin, fire Lt. George Healy of Lynbrook, searched in the rubble for him every day in the days following the disaster. Rosemary Cain said she's had an outpouring of supportive messages from neighbors of the 29th Street firehouse, who "all loved George." She recently appeared on Fox TV news to talk about her son and other missing firefighters. "I needed to do something for my son, to let people know who he was," she said. When one firefighter is lost, she said, "we learn everything about him. But now there are so many, I'm afraid they'll just be names on a list. But each one had a different personality. Each had a family who loved him." Born in Woodside, Queens, George Cain grew up in Massapequa and graduated from Massapequa High School in 1984. A firefighter for seven years, he loved the camaraderie of the firehouse. "I didn't worry when he went off to work because I know they look after each other," his mother said.